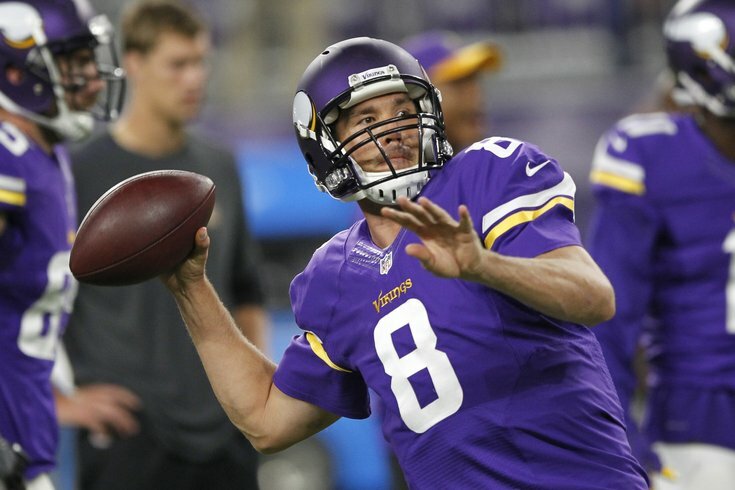 Sam Bradford winds up for a three-yard checkdown. After dropping two straight games to the Detroit Lions and Washington Redskins on the road the last two weeks, the Philadelphia Eagles will head home, where it won't get any easier against the undefeated Minnesota Vikings. Here are five matchups to watch. We all saw what happened to Vaitai a week ago against the Redskins in his first ever NFL action. The Eagles, however, are confident that Vaitai will bounce back, or so they say. "I just think you learn from the good and the bad," said Doug Pederson. "You kind of get your feet wet. You settle into the game. He got better as the game went on. We had other breakdowns, offensively, other than ‘Big V’ [Vaitai], so I feel comfortable with him going again this week. He's the type of kid that's hard on himself. He makes the corrections [and] he moves on. He'll work his fundamentals and technique this week. Again, this is a good pass rush again this week. We'll help and do the things that you are seeing teams do and that we'll do. So we still have full 100 percent confidence that he'll be able to get the job done." Pederson is correct that the rest of the offensive line did not play well either. It certainly wasn't just Vaitai. The Eagles will have to figure out a way to protect Vaitai while simply playing better as a unit against one of the best pass rushes in the league. If you think the Eagles are the only team with offensive tackle issues, think again. The Vikings have lost both Matt Kalil and Andre Smith for the season, and have had to patch up those holes with backups and guys signed off the street. In Smith's absence at RT, Jeremiah Sirles played reasonably well in his lone start against the Texans Week 5. At LT, however, second-year pro T.J. Clemmings has been downright bad while filling in for Kalil, albeit at an unfamiliar position, as he played RT in college. Clemmings' poor play spurred the Vikings to sign former No. 1 overall pick Jake Long, who has not played at all in 2016 and only played in four games (none of them starts) in 2015 with the Falcons. The Eagles will likely see Sirles at RT and either Clemmings or Long at LT, depending on how ready Long looks in practice this week. The Eagles' defensive line is coming off its worst performance of the season last week, as the Redskins' offensive line gave Kirk Cousins plenty of time to throw in Washington's throttling of the Eagles. Still, the Eagles are seventh in the NFL in sacks per game, and have gotten good production from Brandon Graham and Fletcher Cox. Jim Schwartz said this week that Connor Barwin is likely to see his snaps decrease, likely in favor of Vinny Curry. The Eagles need Graham, Cox, and Curry to get to the quarterback whenever the Eagles are able to get the Vikings in third and long situations. The Vikings' 2.5 average yards per carry is worst in the NFL, by a big margin. However, that has not stopped them from trying to run it, as they have attempted 28.8 rushes per game, which is sixth in the NFL. "I think that's a defensive coaches’ mentality," said Jim Schwartz. "As a head coach, they have just stayed committed to it. It's opened up some tight end stuff in the passing game and it's also probably helped their defense out a little bit. I think that all probably goes into it. But after watching us on film last week, I mean, they are going to test us. I mean, I don't care if they are averaging one yard a rush. You watch what we did on film last week, you know, they are in their game plan saying right now we're going to run it 65 times and it's our job to make sure that they don't have success doing that. If they are not having success doing that, then it's not opening up the play-action game and it's also not slowing down our pass rush. That's our responsibility." One of the big themes in press conferences this week has been whether or not Sam Bradford has an advantage over the Eagles' defense, having played against them all spring and summer. Conversely, there has been debate on how much of an advantage the Eagles defense has over Bradford, since there isn't a team in the league that is more aware of Bradford's tendencies than the Eagles. For what it's worth, coaches from both sides shot down the notion that either team had any sort of significant advantage. "Honestly, I don't think so," said Vikings head coach Mike Zimmer. "Maybe if he were calling the plays, and doing all that stuff it might. We've always been kind of a team that does what we do. Obviously, we look for tips and tendencies and all of those things, but when you get in the course of a ball game, I don't think it's as big a deal as everybody makes it." "Maybe a little bit," said Schwartz. "I think you could probably look at it the other way. He's in a new offense. He's in a different offensive scheme, so as much as we know his skill set -- I mean, it doesn't take four months to know that Sam is not a scrambling quarterback. I mean, news flash. But he's a good pocket quarterback and he's a very accurate passer. We saw that in training camp. You’ve seen that [in practice]. "I think you could probably even look at it the other way; he had four months to look at us and we haven't changed schemes. We're going to have to do a little bit with some of our calls and change some of them up, because training camp time, everybody is listening to the words that the offense and defense says, everybody is competitive. You know, there's a little bit of insight but I think that works both ways." Let's just call this matchup what it is -- The Eagles are facing a team that is better than them. If they're going to pull off an upset, it would help enormously if they could make a big play on special teams, as they have done with regularity over the last three years. One player to note for the Vikings is kicker Blair Walsh. In the playoffs against Seattle a year ago, Walsh lined up for a 27-yard field goal attempt that would have given the Vikings the win. And then... Oh no! Walsh may not have recovered from that miss. Prior to that kick, Walsh was 85.2% for his career. He made a Pro Bowl and was first-team All-Pro in 2012. This season, Walsh is 9 of 12 on his field goal attempts, and he has missed two PATs. One of his missed field goals attempts was from 37. He is far from automatic at this point.